BlytheLife.com » Interview with Kayla a.k.a. pin_upkitten and Giveaway! Next in the month of March’s Talent Showcase is Kayla a.k.a pin_upkitten! 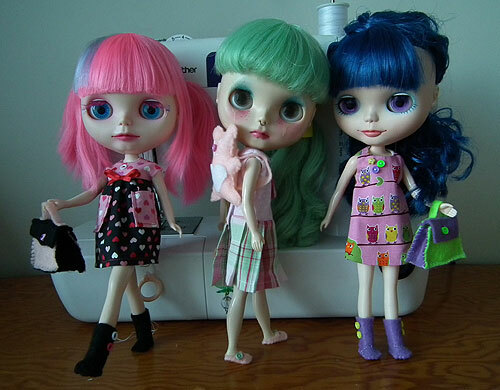 I first met Kayla via the Blythe Swap group when we got paired up as partners. She paints brilliant designs onto fabric that was previously plain and makes it all magical. 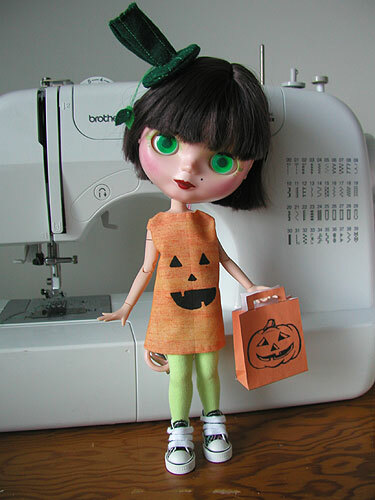 Not only is she an artist, but she also creates felt shoes and boots for Blythe and she customizes too! Not bad for someone who says she’s in a little city with a lack of crafting supplies! Hi Kayla! What can you tell us about yourself? Well, first things first, I am a nut! I am always going 20 directions at once but I’m happiest when busy so it all works out. I am a bit of a nomad, I am constantly on the move, if I stay in any one place for too long I go a bit stir crazy. I have always been into creating and have dabbled in just about everything, I even have a year of design school under my belt. I like to move around creatively as much as I do physically, but luckily I have a super boyfriend who graciously puts up with my shenanigans and experiments! How did you first discover Blythe? What drew you to her? I stumbled across someone’s Flickr photostream a few years ago with a tonne of really great, colourful vintage toys and I kept seeing these really captivating photos of her Blythe doll. I just couldn’t get over how sweet she was and found out everything I could about Blythe, though I didn’t get my first doll until this past may. I love their sweet little faces and the personalities to match! Though I think the thing that has made me fall so hard and so fast for Blythe, is how great of a creative outlet they make. I get to draw on all of my creative background. I am constantly testing myself and new gaining strengths. I love always having an outlet for my creative juices whether it is sewing, painting, photography or my new favorite, customizing! 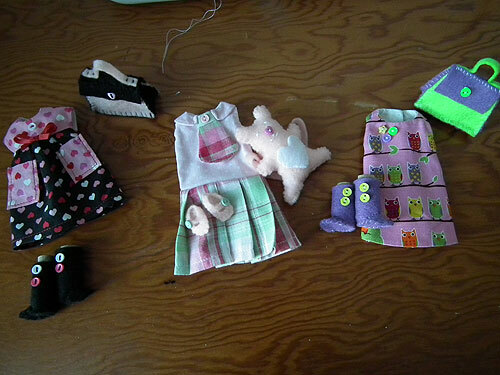 You design clothes for Blythe with handpainted designs. How did you start doing that and where do you draw your inspiration? You customized Zoe yourself and she was your first doll – what challenges did she present to you when you decided to change her look? Honestly, I had NO clue what I was doing. I couldn’t find any Basaak doll specific tutorials when it came to opening or scalp removal so it was a LOT of guess work at the beginning. Luckily for me, Basaak dolls are a piece of cake to dismantle. Unluckily for Zoe, all my trial and error means that she has had 3 separate make overs! Her first makeup job was a disaster, the second was better and her current look is cute but now that I’ve started carving I will probably take another STAB at it, pardon my pun. But trial and error is how you learn, so I wouldn’t trade my mistakes for anything. I know you’ve customized your Can Can Cat and your Simply Guava – what did you learn while customizing them that you wish you’d known while customizing Zoe? The biggest thing I’ve learned is how to overcome the fear, I wish I had that same ability to just jump in while working on Zoe that I’ve had since. The second my Guava, BonBon, arrived all I wanted to was start carving her. Although I was truly awful at sculpting in Art class, everyone else’s gorgeously carved, highly emotive dolls really inspired me and I HAD to tackle it. I was so happy with how that turned out that I wanted to add rooted highlights to BonBon, give Can a boil perm, change eyechips and even work on a few petite reroots all of which were completely foreign to me! You’ve made some pretty creative things for Blythe since joining the hobby – what would you say has been the most difficult thing that has happened so far in your creative process? Well, the most difficult obstacle has also led to the best results! I live in a really small “city” and crafting and sewing supplies are in limited supply so I’ve had to improvise a LOT. I couldn’t find any doll furniture I liked so I made a kitchen from upcycled items around my house. Then I started participating in Swaps and without a fabric store in town I had to make use of my current fabric stash, which always has a tonne of plain white cotton, so I experimented with dyeing and painting it and loved the result! And THAT is how my hand-painted dresses started! A lot of the things that you’ve made so far have been for yourself or for swaps, what do you have planned for the future in your clothes designing venture? Where would you like to see your customizing go in the future? Do you have any plans? I really want to keep growing and honing my skills. There are always new skills and techniques to learn and that’s part of keeps me driven. Looking around at all the gorgeous dolls that the top customizers create is really inspiring and is definitely something I aspire to, in a perfect world, I would be a full time dolly clothier and customizer bringing Blythe cuteness to the world! 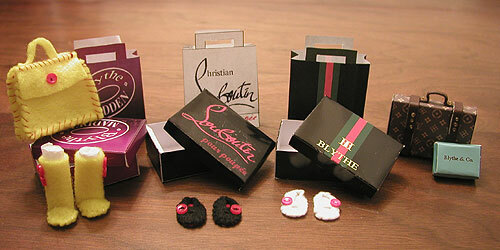 I think that it’s fantastic that you just jumped right into customizing your dolls. What’s your favourite part about changing the look of a doll? I like that extra glimmer of personality it brings to our big-eyed friends. They become so expressive and individual. Take BonBon and Can for instance, BonBon always looks kind of unsure and reserved, while Can is all bubbly and full of soft smiles. They take on the characteristics of my favorite (non-plastic) people, sitting with Can always reminds me of one of my closest friends, while Zoe is a sassy mother-hen, much like my own mother. How has entering the doll hobby changed you so far? It has definitely helped to reconcile me with my creative side, I had hardly touched my sewing machine since leaving school. 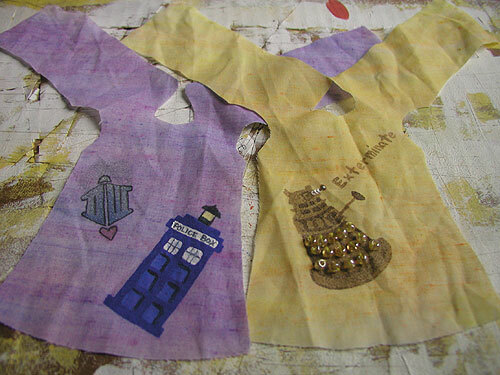 I even sew and paint about a 20 times more often now! Also, the community is a blessing! I was beginning to feel cut off and disconnected, having moved away form all my social roots, but the Blythe community is so open and welcoming. The open discussion and encouragement has really helped to get me back out of my shell. Thanks so much for doing this interview with me, Kayla! What kind of advice do you have for someone who’s new to customizing? JUMP IN! Don’t let the fear of failure hold you back. Mistakes are natural and luckily in the Blythe world there always seems to be someone willing to jump in with a tip or some advice when you find yourself in a real pickle. You can find Kayla over on Flickr! The above image is an example of what you could win! Kayla is offering up one custom handpainted dress with a matching pair of shoes or booties for the winner of the giveaway! You’ll get to pick something for her to paint on an A-line dress. You can get up to eight (8) entries for this giveaway draw and you can enter until Saturday March 31st 2012 at 11:59pm PDT. The draw will be held on Sunday April 1st 2012 and the winner will be announced on BlytheLife.com. Remember to use a valid email address for all comments. If you win, your email will be forwarded to Kayla so she can get in contact with you about your custom dress set! Mandatory Entry: Comment below about this interview or what kind of design you’d want on the dress if you win! This is worth 1 entry into the giveaway. Bonus Entry #2: Blog about the contest! Be sure to include some details about the contest and include links to BlytheLife.com, this interview/giveaway page and to Kayla’s Flickr photostream! For 1 blog entry, this is worth 5 entries into the giveaway! You must comment below with the URL to your blog post. Necessity certainly is the mother of invention! Kayla’s work is lovely. The bravest I’ve gotten is to cut some bangs! As a girl who lives in a small town and is challenged by lack of crafting supplies, I really admire Kalya’s inventiveness… I wish I was more creative – I just end up driving to other cities and stocking up! Love that mermaid dress! I’m an Aussie so there is really nothing in the way of doll stuff, but I do have a lovely big craft store. Kayla’s stuff is so inventive. About the giveaway: Anything sweet and animal themed would be great! I can relate to the fear about customizing when you’re still a beginner. ^_^; You want to jump into things and start a project right away, but fear can hold you back and delay the process. All you need is a little courage! Though I’ve had all the customizing tools needed for years, just thinking about carving the plastic makes everything all the more daunting to me! Handpainted dresses are such a great idea. That mermaid one is so pretty. I think one with trees would be pretty. 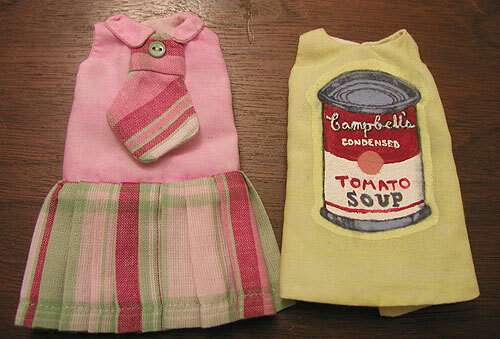 I agree, my dolls have inspired me to get back into crafting. As far as theme for the giveaway- I love anything fantasy!